You must have checked out the Moto G 3rd Gen review, actually we reviewed the one with 2GB of RAM and 16GB of ROM, worth spendijg money on it for sure, but what about if you’re looking for something under a tight budget of ₹ 12,000? Galaxy J5 could be a good choice as well apart from Moto G 3rd Gen with 1GB of RAM and 8GB of ROM. So, let’s find out what are the features and difdferences between the two. Samsung Galaxy J5 is much slimmer if we put it aside Moto G 3rd Gen. However, the Moto G 3rd Gen comes with IPX7 certification, hence water resistant. Moto G 3rd generation measures 142.1×72.4×11.6 mm and weighs 155 grams while Galaxy J5 measures 142.1×71.8×7.9 mm in dimensions and weighs 146 grams. Though Moto G 3rd Gen has a premium build quality. Both handsets feature 5-inch HD display with 1280×720 pixels resolution. But again we have spot a hige differnec in display by looking at them, the Galaxy J5 has a way better Super AMOLED display which is more vibrant and colorful as compared to the LCD that is available on Moto G 3rd Gen. Both device are powered by a quad-core Qualcomm Snapdragon 410 processor. 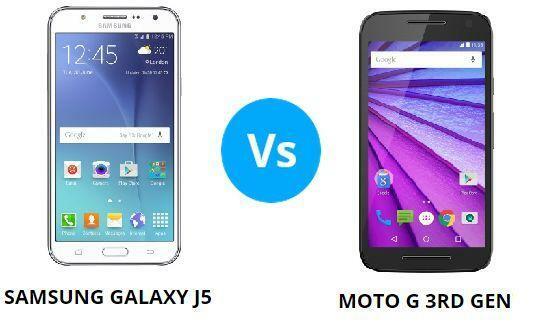 The Galaxy J5 is clocked at 1.2GHz coupled with 1.5GB of RAM while Moto G is clocked at 1.4GHz paired with 1GB of RAM. In case of GPU as well, they are similar becaue both the phones have Adreno 306 GPU. The Galaxy J5 is backed up by a larger 2600mAh battery as compared to 2470mAh battery of Moto G 3rd Gen, also the AMOLED display with consume lesser power, but on;ly if you adjust the brigtness perfectly as the Galaxy J5 lacks ambient light sensor. Both smartphones sport a 13 mega pixel camera on the rear and a 5 mega pixel front facing camera. The Galaxy J5 comes with dual LED flash with rear camera and LED flash with front camera. While rear cameras of both phones are equally good, the front camera of Galaxy J5 has an upper hand due to LED flash for better selfies. Both devices offer Dual SIM, 4G LTE, Wi-Fi, USB OTG and Bluetooth as connectivity options. If you’re having a tight budget and want a phone which has an excellent display and battery backup, you should definitely go for the Galaxy J5, well along with that you also gte amp-le amount of RAM i.e. 1.5GB whereas you will get just 1GB of RAM on Moto G 3rd Gen. However, if you need a really premium looking, study and water resistant phone you should definitely go for the Moto G 3rd Gen, and if you can bump up the budget up to ₹13,000 never lok at the Galaxy J5 and grab the Moto G 3rd Gen. Below, I have added a comparison table, and also at the bottom have added the links from where you can get these phones. Previous articleUlefone uWear smartwatch @ just $30 [DEAL ALERT]!